Physical literacy develops as children gain the skills, confidence, and love of movement they need to be physically active for life. Crawl, hop, skip or run. Toss the scarf in the air. Turn, clap and catch it. The number on the card represents the number of times to spin, touch toes or balance on that number of body parts, etc. Roll or kick the ball back and forth. Practice throwing the small stuffed toy underhand, back and forth. Roll the ball towards the target. Kick the ball towards the target. Place it on the floor, jump back and forth over it. Focus on fun and play as your child continues to develop physical literacy. Invent your own activities and discover more ideas! 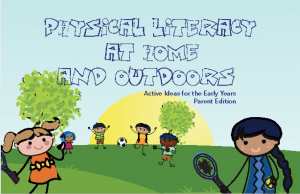 Filled with activities to do with your child to get them more active and physically literate! Includes the popular FUNtervals. 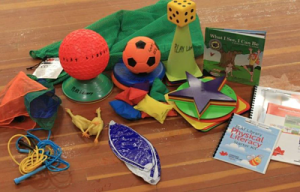 Starter Kits: For children 0-6, movement experiences help young children develop jumping, throwing,catching, kicking, hitting and balancing. Family Kits: For use by the entire family, small or large, to continue to develop sport specific fundamentals. Includes a Family Kit Resource Booklet of Activities. City of Kingston, Artillery Park, 382 Bagot St.–Starter Kits and Family Kits available to check out year round. Kingston & Frontenac Housing Corporation, 119 Van Order Dr.– Starter Kits available to check out during July & Aug.
Each location determines the length of time that a kit can be borrowed. You will be given a take-home bag. Individuals should be asked to return the completed questionnaire when returning the kit. Sport for Life (S4L) is a national movement that was started to improve the quality of sport and physical activity in Canada. S4L Kingston is increasing opportunities for sport and recreation activities in the Kingston area.